I love you, President Obama. Love you. AMK, hope you are having a wonderful birthday; many happy returns. And speaking of returns, hurry up and get back here in time to spend the final hours of the election with us. I missed AMK’s birthday? Oh no! Happy Birthday, AMK!!!!!!!!!!!!!!!!!!!!!!!!!!!!!!!!!!!!!!! Oh wow! Happy Birthday Amk! Hope you are still partying hard! Nerdy, not sure what we’d all be doing without you. Thank you! Ya know, after nearly 10 years I should no longer be surprised, but I am. The way our beloved President can move the numbers is staggering. Just saw some new numbers out of FL by county, and you can see where he was the last couple of days just by the way the numbers turn. A couple of counties that were behind have turned Dem in early voting. But I also need to give credit to the Clinton campaign for knowing where to deploy him. They have run an amazing campaign, particularly when you consider the obstacles they’ve face. Totally agree. And, luckily for the Clinton campaign, they have a few Obama campaign people with ’em for the ride! Yay! Co-sign! Thank you Nerdy! Love you! Dan Pfeiffer unleashed. Love it! Penetrate and stay there! Please. Trump says you guys are losers…Bet he wishes he could take that back now….Too late, loser! Telling that a 70 year old man runs against a 69 year old woman & it's the man who ends up looking like a freak trying to hide his age. “you feel free right now?" No sound on Hillary’s link. I always have trouble with her feeds! I wondered if it was that, or if it’s because it’s the concert portion. The networks could not broadcast the Be and Jay concert last night except for a set number of minutes. Hmmmmm…..you could be right about that. But it’s a free concert and the campaign is linking to it so I’d expect it to run without technical issues. Oh well, just glad there’s a good celebration going on. Same with me. Like FoxfireTX, I assume it may have something to do with copyrights. I notice that accept for the music played when POTUS and FLOTUS come on stage, the music played during the rallies is some generic tune rather than what’s actually being played at the rally. Clinton Campaign adds another rally on Monday for Pres Obama – in Ann Arbor, MI. In addition to previously announced rallies in NH and PA.
Hi JER. This has got to be one grueling final push for all concerned. I bet Pres O (and all the other active Dem leaders/speakers) will be as happy as we all will be when Wednesday rolls around!!! 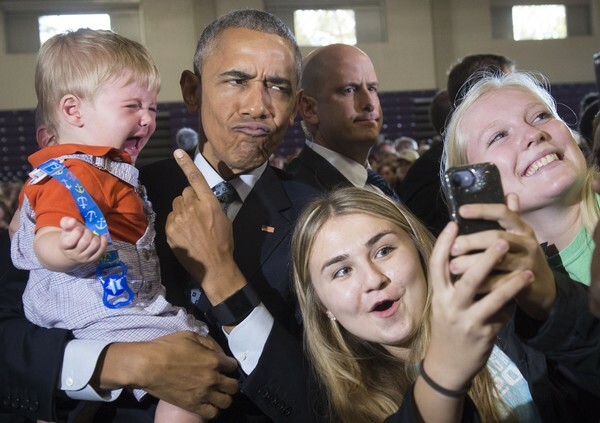 I like that POTUS seems to be enjoying the campaigning. Oh, there’s little doubt he is, but that’s a heavy load he’s lifting, while still doing his ‘day’ job. May God continue to lift and sustain him and all the others who are working their hearts out during this final surge! Our guy and all of the other surrogates and volunteers, and of course HRC herself are determined to leave it all on the floor (or at the polls). We run the race until it is over because we have a country to save and a world to reassure. I think PBO is enjoying it. The pressure is off him personally, and it has been a love fest wherever he goes. I personally am so happy at the reception he’s getting, like a big huge THANK YOU, WE LOVE YOU from the country. You can tell he is, FfTX! 🙂 However, enjoyment notwithstanding, what he’s (they are) doing is *hard*, and draining, work. True, but as long as he is presidenting, it is all hard. At least on the trail he’s getting some love in return! Sorry if this was already posted … love it! “In many ways, in fact, the 2016 election is looking like the antithesis of 2008. Back then, the United States elected its first black president. He was untested on the national stage, but millions of Americans responded enthusiastically to his eloquent and upbeat vision of hope. Think about it: a mere seven years after the 9/11 attacks, Americans somehow elected a man with a Muslim father and a Muslim name. Even more remarkably, they elected a man whose middle name was Hussein, only five years after we had invaded a country whose tyrannical leader had that name, too. The rest of the world saw in the 2008 election the energy, creativity, imagination, fearlessness, and hope that has long characterized America’s providential history. If America could do that, they thought, it could still surprise the world and still do great things. And it is perhaps worth remembering that Barack Obama is today the most popular politician on the planet. “…but his candidacy itself has already done a lot of damage” and whose fault is that? Who has profited? Who chose personal ambition over integrity and country for decades? Who is responsible for the implosion of an entire party? I am already sick of these dishonest analysis over the rise of the carnival barker and his acolytes. No one who is honest or has been “woke” over the past 40 years is surprised or confused about how we arrived to this sorry point in our electoral history. these kind of analyses…irritates me so…. Donald Trump and Trumpism are not the cause of the racist hatred and hostility that is a trademark of the Trump candidacy…instead it is the result of the obstructionism of the GOP in response to President Obama being elected…where has the press been in the last 8 years..they were blinded by their own white privilege…. Do not forget it is time for “Fall back” from Daylight Saving Time. Turn the clock back I hr. before you go to bed tonight if you live in an area that plays the time game. The dry humor here made me laugh out loud. Ah yes, when you advocate violence…..Not a good look. Fitting payback given the violence he has condoned against Hillary. CNN: Law enforcement official tells CNN no weapon has been found related to incident at Trump rally in Reno. Cannot wait until this goddam election is in the history books. I was watching MSNBC when it happened. From watching and hearing the commentary it did not seem like an assassination attempt, just a protester too close to the podium. GE Arapaho! Did you see that Slate link I left for you the other day re: Comey’s background? Also cannot wait until this is over. Apologize for not responding, FFTX. That article was a good, succinct overview of Comey, but I’m trying to carve out time now to dig deeper (been wanting to do so since the beginning of the week, but seem there’s not enough hours in the day — plus we’re having a heat wave now (aka Climate Change), so my non-succulent plants think it’s Spring, just as I’m getting ready to get them ready for Winter, so they demand a lot of time, and so little daylight to tend to them… grateful for an additional hour this weekend). The best article I’ve had a chance to read is a pretty lengthy one from Eric Holder’s former speechwriter — every single paragraph has an OMG quote in it — and trying to tie what he says with other information out there — think I’ll probably complete after the election, though, because I’m intensely interested in the how the downballot races (Governor, House, Senate) are shaping up before Tuesday rolls around. Enjoy your extra hour tonight/tomorrow morning. Haven’t looked this forward to an extra hour for a long time. Comey’s past work experience, cases he’s prosecuted and how the Ashcroft-in-a-hospital-bed drama elevated this venal, cowardly person to high saint status by MSM is appalling. Based on the timing of his nomination for FBI director, it seems as if PBO were operating under the assumption that Joe Biden would carry on his legacy as President. Otherwise it makes no sense for PBO to nominate someone who was a Whitewater prosecutor (among other things) as FBI director, if PBO planned on supporting HRC in 2016. And since this was written by a former speechwriter for Eric Holder, you would think that the then-DOJ AG would have cautioned PBO on this nomination. This is one more reason that I firmly support getting people from outside the northeast power corridor of the US into positions of responsibility. There’s just too much cronyism (e.g., Giuliani’s ties with Comey) for it be healthy for this country. Why would rumors of an armed man at a Trump rally spark panic? Wouldn't his open carrying simply make everyone safer? Add “paranoid” and “martyr” to the list of adjectives for #Trumpaloons and their Dear Leader DJT. A man beside me leaves his bag on his seat for a sec. A woman behind him starts interrogating me about whether there's a bomb in the bag. We don't definitively know what happened tonight. But there are a lot of people very much on edge in Trump crowds, seeing danger lurking. …and in the country more broadly right now. Tense, tense time. #FalseFlag | This #PunkAzz @realdonaldtrump has his folks fake a disturbance at rally. Give me a frigging break. #SAD! jazzia2, I thought the same thing. It’s fake. I was watching MSNBC when it happened at the rally. From the commentators and a journalist there it seemed to be a protester deemed too close to the podium. The secret service encircled Trump then rushed him off the stage. Then security jumped down and tackled the man. A CNN camera man tried to take pictures and the crowd took his camera away. Most of the journalists were leaving as requested by security. "For Clinton—I'd give my heart for her." —Wounded warrior and Marine Corps veteran Jimmy Ochan. Yay, an extra hour in the day (sorry, DF and Susanne, radio tells me most of AZ and HI don’t go back to standard time tonight — know from my AZ travels that the Navajo Nation *does* observe Daylight Saving Time, so it can be confusing when touring AZ in the summer). TNMtnGirl posted (what I assume to be fake news) something here yesterday about an alarming article which appeared on her Facebook page (not on Facebook, so don’t know the terminology for that site) and I responded with a Buzzfeed story about how Macedonia is reaping in lots of cash by creating fake stories (either pro-Trump or anti-Hillary) and then generating Facebook hits. Here’s the Buzzfeed article — I didn’t read it, since I’m not on Facebook and only click links from trusted sources (usually MSM or TODville). Hey gal, I did see your response last night. Glad you posted this again. I sure didn’t respond to that comment. ****Bringing this over because I want (and hope) more of you will watch/listen. It is worth your time. Friends, This is from 4 years ago, the Sunday before the election. Entitled Choose Well. The words are just as appropriate today, maybe more so. Steve was our Senior Pastor, who has since joined so many of mine and your loved ones in Heaven. Hope many of you will take the time to watch and listen. Also, Have any of you seen the Facebook page Pantsuit Nation? It is awesome. Has the most amazing, uplifting and sometimes funny stories of people’s support for Hillary. For any of you on FB, do a search for it. We just learned that Henry Cisneros, former Mayor of San Antonio, former HUD Secretary and former Univision head, is coming to our Salsa the Vote tomorrow night!! I’ve heard Cisneros speak in person at least twice and he can really stir up an audience. It’s utterly amazing that such Clinton advocates as Madeleine Albright and Cisneros are coming to our county and shows the determination by the Hillary campaign to leave NOTHING on the table. Fantastic news! You have worked so hard on this year after year and from your reports it has grown and produced fruit in new voters. I hope that they day is all that you and the other volunteers hope that it will be. Looking forward to hearing how the event turned out. You totally rock, JackieG; I want to be like you when I grow up. OMGosh, JackieG, that is so great! I’ve always had a soft spot in my heart for him, how exciting he’s devoting time to your event in a less-frequently visited PA town. He probably heard about the success of your Labor Day event (sorry, can’t remember the name of it, but Alycee and Sherry (? sorry, I’m operating on memory, and obviously my memory isn’t what it used to be) stopped by to party. What a hub your town is this weekend — first Madeline Albright, and now Henry Cisneros. Hope you can get a photo or two of him #SalsaTheVote. Will do, arapaho, even though I’m absolutely lousy at photos. So thrilled Jackie that all the years of work you’ve put into this is paying off! Such a satisfying feeling. And it will be soooooo worth it Tuesday night! Make sure to get a ton of photos to share with us! Great news Jackie G! Thanks for all your hard work. Jackie, so proud of the work you’re doing out there! So sorry I’m going to miss crashing the Salsa! Look forward to seeing the pics and MAYBE a video or two! Neat thing about PA NOT having early voting, we get ALL of the heavy hitters on GOTV weekend. Tomorrow, Chelsea will be in my Borough to knock doors. The faces of the Deplorables. There just aren’t enough adjectives for this injustice. And this is for Chips, if she happens to spend her extra hour here at TOD (though I think other countries set their clocks back last weekend). Ireland just beat New Zealand for the first time in 111 years. In Chicago. Can't make it up. She’ll get one or two visits! Trump complains about HRC doing event with Jay Z because lyrics. Trump will appear tomw in MI with Ted Nugent. I am dead now. Ted Nugent, the singer who sings about liking young teenage girls. No-one I spoke to saw a weapon. They just heard shouts. Even one of the men who jumped on top of the man said he didn't see any weapon. Mannn. There is a little girl here at this Trump rally in Reno, probably no older than 7, wearing an InfoWars shirt. I gather Nate had a twitter meltdown/war. Lucky it wasn’t at 3am or he might have been confused with someone else. LOL. Such a small word; yet, so many wackos. 🕉❤📿👁👁 AMK 👁👁📿❤🕉 OH yeah!! The women are bringing it! Little Nate’s fee-fees are hurt. He’s been hanging around too many republicans. His skin is getting thinner by the minute…. I don’t have an email for him, but I am worried too. I am also increasingly concerned that Chips is done with us 😦 Am feeling very depressed about it. I have survived a week on the ballot board and only two more days to go. I’ve only gotten into one fight. The Republicans have a new voter suppression plan: We have a retired Republican judge who wants to disallow every ballot where the signature doesn’t exactly – dammit, exactly – on the back of the ballot envelope to the application. Okay, 98% of people who get a mail ballot are either over 65 or disabled. They requested these ballots back in January. I am over 65. If I go from January to the end of October without falling down, smacking my head against the top of the car door, having my shoulder go out on me, forgetting where I put the damn ballot when it arrived and having to fish through the garbage to find it, or can find the same pen in October that I used in January, then y’all throw flowers on me because I am dead. Sometimes I use my birth name as my middle name, sometimes I don’t. He hates that so I will continue to do it forever in his damn honor. If you sign one with a felt tip and the other with a ball point, you have forsaken your right to vote. If your T isn’t crossed at exactly the same level or your I isn’t dotted in the exact same place you put it January, he will defend his right to void your right to vote. Sumbitch needs to get a damn life. I am going to sign him up on every liberal email list I can find and make donations in his name to every damn Democrat in Texas. He’ll be so swamped with mail and email that we’ll have to get professional spelunkers to come find him. That’s how liberals do things. The only part I added above to this description was the reporters were asked to leave and a CNN camera man trying to photograph the guy had his camera taken away from him by the crowd. I want to give a shout out to GGail tonight. I went phone banking in Pasadena thanks to her and had a great time, met some lovely people, and made calls to Colorado. I’ve never done this before (as I’ve only been a citizen since 2009 and this was a big step for me). Lots of people told me they’d already voted for Hillary which was so heartwarming. So, thanks GGail for a great experience. Good for you Betsy, that first step is the hardest. The best part is all the wonderful people you meet and talk to. You find out you are not alone. Excuse me, the above link is to an article by Sam Wang asserting that confidence of victory is a good motivator to vote, and gloom and doom drives down voting. This news about the ABC National tracker showing Clinton with a growing lead +5 is a good confidence builder, even though now the big thing is GOTV in the states. Harry Enten works for Nate Silver – turning around to get the right result on Tuesday. GOP has virtually no GOTV Bill, so if that is the need, Hillary Clinton has it. Before going to bed, I am going to post about IA. The DMR final poll came out tonight and Trump is up by 6, and even up with younger voters. A few people freaked out on Twitter, thinking it perhaps portends badly for the remainder of polls because there hasn’t been much change in the composition of the electorate the last 4 years. I disagree with that assessment, but think HRC could lose IA for three reasons. This is my part of the country so I know it pretty well, and my sister and her husband retired to the family farm there a few months back. First, it is pretty low on the educational spectrum. I specifically looked at stats when I was talking with my sister about why Hillary wasn’t doing well. Just 25% of the adult population have college degrees. Second, PBO had a very special relationship with Iowans. They took great pride in launching his presidential bid, and he never forgot it or them. If you’ll recall, his final 2012 rally was, of course, in IA. He has always gone “home” to them. To think these feelings would transfer to Hillary doesn’t make sense. PBO built his support there with Michelle, and it held for him but it was personal to him. Finally, it has become much more Republican over the years and there is a very strong R organization there from the long time GOP governor, Chuck Grassley, Steve King and Joni Ernst. They support Trump so it is one of the few states where there truly is a GOP GOTV. In short, while I think HRC may well lose this state, I don’t think it means anything in terms of any other polls elsewhere. It may well have gone GOP before this but for PBO’s relationships there. Obviously, just my personal opinion but I am not concerned about losing these 6 electoral votes. I would not draw any inferences from the polling or early votes there, and any other state. And finally, 40 million Americans have cast their ballots. At this point, polls mean very little. I primarily am looking at EV results rather than polls. Good night TOD, and thanks to everyone for the support for this community. Iowa has been iffy from the beginning. I expected this. Update on DJT disturbance tonight. #Trumpaloons are feral, vicious animals. They are inhuman. He says he's a Republican. He said he was terrified by how the crowd responded: "I was in survival mode. I knew I could die at that moment." Austin told me he was punched, kicked. Someone grabbed his testicles and he his neck was in a chokehold. He said he feared for his life. His name is Austyn Crites. He's 33 and works on high altitude balloons. He's voting for some Republicans this year – just not Trump. I wonder if the part about the crowd turning on the CNN camera man trying to take a photo and his camera taken away by the crowd will come up at all? I thought that was bad too. Imagine the mockery Trump and his goons would subject Clinton to if she were yanked off a stage because someone pulled out a sign. Does anyone know where in Detroit President Obama will be? @AlGiordano A++ you are the only reason I am going to be sad when this election is over. PEC EV forecast as of this moment HRC 323, DT 209 and Iowa a tossup (6EV). Of the other forecasts on PEC site, only CNN has HRC with solid/leaners <270 at 268 Vs DT 204 and 66 toss up. I hope HRC, in addition to getting PEC forecast, hope HRC also wins Iowa 6, Ohio 18 & Arizona 11 for 358 EV. LOL. HRC will win 270+ EV's with 100% certainty. PEC is at 99%. I think Sam Wang is right in that 538's treatment of polls is causing it distort it's forecast. Pity. I really enjoyed following 538 for the past two Pres elections. To sum up: a Republican unhappy with Trump tried to exercise free speech, and Trump's crowd beat him up for it. They caused the disturbance. 144 years ago today Susan B. Anthony tried to vote for the first time. And was fined $100. Urging people to dress in white as they head to the polls on Tuesday, particularly women. I watched a panel with Jonathan capehart on joy reeds show yesterday. On it they were discussing the openings trump may have with AA voters. Capehart discussed that trump has an opening Bc the black community is very disappointed in the democratic policies of the federal government(however noting that he doesn’t have a plan). My concern is this… Does capehart realize that republican governors have done their very best to stop any federal government progress(and yes that includes the AA community). Sometimes he doesn’t know what he’s talking about. Remember folks what happen when a Trump supporter was at a Hillary event in Fayetteville NC that President Obama was speaking at, now we see what happens at a Trump event. And the Trump people tries to say that someone was trying to kill Trump. Speaking out quickly, accusing others wrongly are both traits not needed in a leader or administration especially when dealing in International events. The treatment of protesters yesterday by both campaigns shows the difference in responding to emergency events.